This is the only information I’ve seen about this remedy. Apparently, Datura Arborea has never been proven. Rather, the information in our books is derived from a Dr. Poulson who was intoxicated by the smell of the flowers in his room. The follow-up on this remedy is now about a year and a half. I just spoke to this patient (11/16/03) and she is still doing very well. Hopefully, this information, Materia Medica, and the use of family theory will lead others to successfully use this remedy. Eventually we will develop a more definitive clinical picture. •	Other standard nighshade themes, i.e. hydrophobia, insanity, demons, etc. Synonym, Brugmansia Gardneri, Ruiz et Pav. This is a native of the Pacific coast, northward from Peru to California. It flowers are long, tubular, bent downward, snowy - white, and of a very sweet odor. It was introduced to the homoeopathic profession by Dr. Poulson, United States. Toxicological effect much slower than D. Stramonium, but dynamically very intense and lasting. The odor of the flowers in a room causes considerable psychological aberration. A very strange feeling of pleasant ease and comfort, as if I scarcely touched the earth with my feet, and had to gather my ideas from afar, as if they were floating in the clouds. A longing for beauty and fine scenery. The brain seems floating in thousands of problems and grand ideas, without being able to concentrate itself, or get to any point and carry out any system of thought. Cannot concentrate thoughts; brain floats in thousands of problems and grand ideas. Floating sensation as if ideas were floating outside of brain. Headache, heartburn. Burning sensation around cardiac end of stomach, extending to oesophagus with sense of constriction. Heat and fullness over liver region. 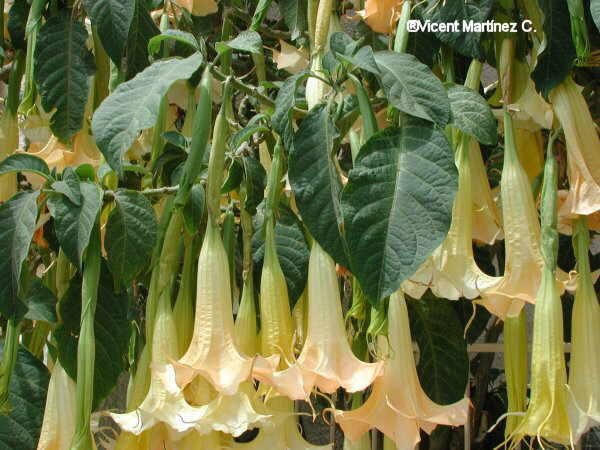 It is interesting to note that Brugmansia was used by South American Natives to make contact with the spirits world. 40 Years ago my friends experimented with this plant. What I noticed is they believed they were somewhere else, even describing their visualizations very clearly. Not a good idea to do without some medical expertise around. They could not read any writing for about a week after.